We have EDGE cages ONLY. 900-1030am: optional for 14u Blue; 14u Gold as well as 12u Blue team members. Winter workout player can attend as well. 1030am-Noon: optional for 12u Gold; 12u White; 10u teams as well as winter workout player in that age group. **Reminder, Fastpitch Fitness classes are complete. Orders have been placed and should be receiving your package by end of April. Any questions can be directed to Nick Caiazzo. Thank you. Players last names will be on back on each jersey along with their # provided (from winter workouts). All players need white pants and navy blue pants this spring/summer. They are optional on the site as if players already have a pair they like, they don’t need to purchase online thru the website provided. These uniforms will be dropped shipped to their home address provided. Not to the EDGE Academy. Deadline date: the store to be closed on Sunday. April 7, 2019 @ midnight. Sample sizing (tops and pants) are inside EDGE Academy for anyone that like to try on this weekend at practice. Check out the website, contact Nick Caiazzo to attend a winter workout, meet our coaches and players if interested in joining a team.Thank you. We also provide a "winter training" opportunity for all age players looking to get ready for their spring season and not have to worry about travel during the spring and summer weekends. Contact Nick Caiazzo for more details. 2019 Medical Waiver Form FOR ALL PLAYERS...Must be signed and sent back to Nick Caiazzo before 1st workout. Interested in Maine Thunder travel SB program? Please contact Nick Caiazzo (ncaiazzo@maine.rr.com) if interested in joining a workout. Deposit payment due on roster acceptance, Check out each team page for payment schedule. All payments are non-refundable. Jessica led the Bulldogs to a 14-2 record and a berth in the Class A State tournament at the time of her selection. Jessica posted a 9-1 record in the circle with a 1.66 ERA and 101 strikeouts in 72 innings. She also batted .465 with 10 RBI, a .628 slugging percentage and a .549 on-base percentage. 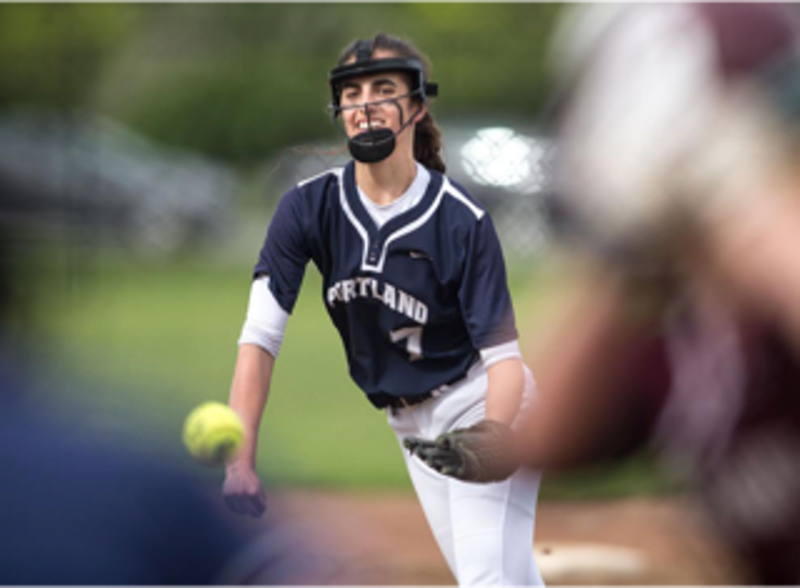 Jessica was also selected as a pitcher to the 2017 SMAA All Star First Team, and the distinction of being selected to the 2017 Telegram All State High School Softball team. Jessica Brown has maintained a 102.2 average in the classroom. She is an accomplished pianist, member of the National Honor Society, the Girl Scouts of America and the Math Team. She will be playing on the Maine Thunder 18U Showcase team during the summer, and begin her senior year of high school this fall. 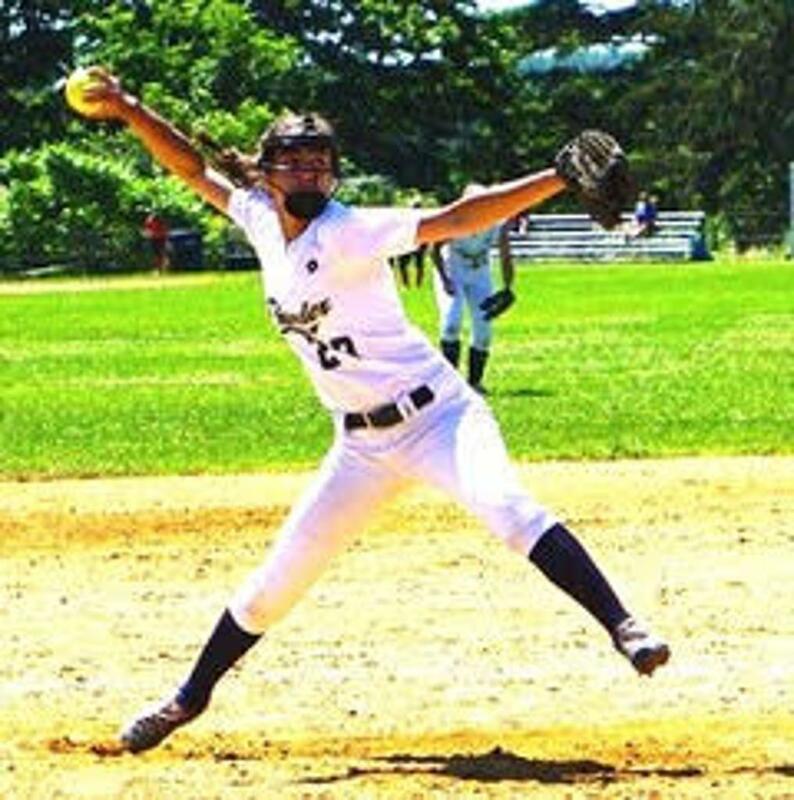 Kirsten Pelletier - Messalonskee HS (RHP) - attending the NESCAC's Bates College. 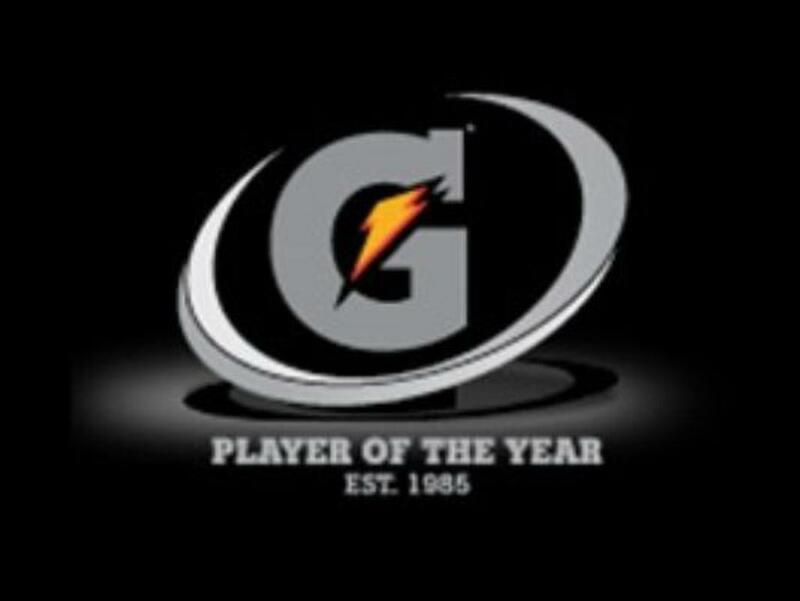 Congrats KP. We look forward to watching your collegiate career. Just wanted send a tip of my cap out to you, your staff and your kids and their parents !!! This past weekend I had the opportunity to see your Maine Thunder girls compete in three of your five games at the New England's Finest Showcase. 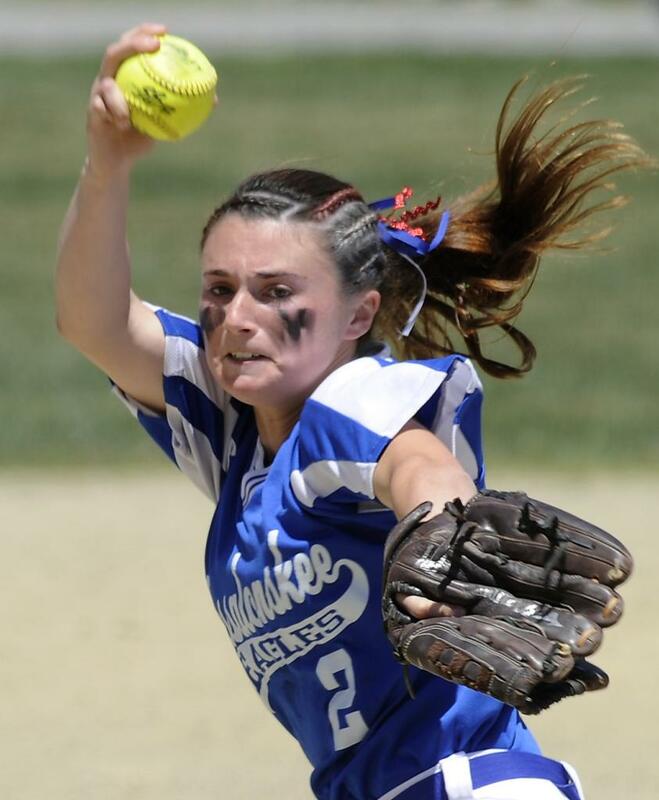 We are very interested in Player 1, Player 2, Player 3, Player 4 and believe they would be a terrific fit at UMass-Dartmouth in the classroom and on the softball field. Those four young ladies represent exactly the type of student-athlete we want to bring into our program to keep the softball "culture change" at UMass-Dartmouth moving in the right direction. It was very refreshing to observe how your kids did things "the right way" on the field, in the bench area and during their pre-game warm-up. I know they didn't arrive in your program that way so "Thank You" to you and your staff for doing an outstanding job polishing their skill sets and developing an overall positive approach to the game !!!! I would recruit EVERYONE OF YOUR KIDS if I could !!!!! If anyone asks me about the Maine Thunder Program my answer will simply be CLASS !!!!! Please share this email with your staff as they deserve an att-a-boy !!! "Coach Whitney and Kevin were AMAZING!! I really can't say enough how wonderful our entire experience was. Thank you for providing such exceptional coaches and making our first year so wonderful." I just wanted to extend a special heart felt thank you to you for a great season of travel softball. Your passion for the game, love for our girls and commitment to teaching them skills that expand far beyond the boundaries of the softball field was truly fun to be a part of. Anyhow, thanks again for an amazing year and for serving as a great role model for Chloe and her teammates. Ryan Sullivan - your coaching abilities are unmatched and I certainly hope to cross paths with you again in the near future. I hope we can keep in touch. We wish you both the best this coming season and hope to see you on the field in the future. Ryan Sullivan was a great coach and his temperament is very admirable. We were all happy with your Thunder program. My daughter's first year of travel softball at Maine Thunder has come and gone.... Nick made it all happen. He saw something in Christina and gave her a chance. Nick runs an awesome program at The Edge Academy. Under Nick's guidance my daughter, as well as all her teammates play at their full potential. Thank you Nick for this opportunity. We are proud to be part of Maine Thunder Softball. Over the years, we have been extremely fortunate to have had some of the best families pass through our program. With the growth of softball in Maine we have become the training ground for players who are looking to challenge themselves to be the best they can be. All players train at the Edge Academy which is located at 512 Warren Ave. in Portland. The professional staff at the Edge Academy not only coach in our travel programs but are available for individual and group instruction as well. We not only train players, but we train coaches and offer guidance to parents on how they can become good sports parents for their aspiring athlete. Team Training will begin in November and run through mid March until high school pre-season begins. Maine Thunder Softball is where you can get everything you need to play at the next level. Whether it’s little league, middle school, high school or college, we can help players identify areas what they need to work on in order to continue their progress of achieving success on the field and off. We stress the importance of academic success in the classroom coupled with time management. Without a great education, softball doesn’t exist. We look forward to working with your daughter and helping her attain the goals that she has set for herself. Please go to www.edgesportsmaine.com for the registration form for tryouts. Thanks! The Maine Thunder Coaches all fall under the same title...professional teachers. Under the leadership of Nick Caiazzo the Thunder program is focused on providing all players with an opportunity to reach their full softball potential. The Maine Thunder Travel Softball Program prides itself in training coaches through on going staff training sessions, ASA Certification and our partnership with Positive Coaching Alliance! We are excited to bring some of the best people together to teach, coach and mentor your daughter.